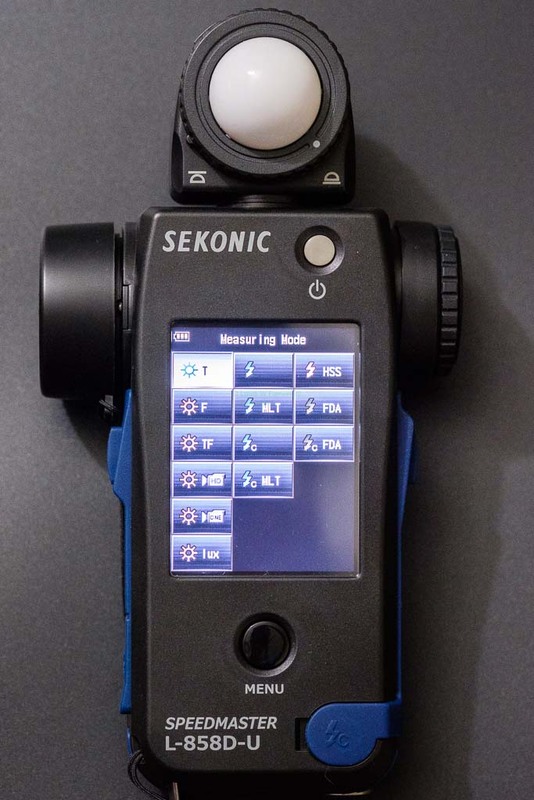 Digital cameras have reduced the perceived need for light meters, which is why light meters like the Sekonic L-858D-U have evolved to do so much. I am one of the many guilty photographers out there that have relied on in-camera metering and experience to get the shot right, but my recent experimentation with long exposure photography and interest in filters got me interested in light meters again. You can waste a lot of time on long exposures if you don’t own a light meter and I simply don’t have the experience to compensate yet, so the Sekonic L-858D-U caught my eye as it was released around the same time as my experimenting with long exposures. Further, by complete chance, I was selected to receive a review unit of the Sekonic L-858D-U, which is always a great opportunity. There is a perception by some that these units influence reviewers, but in my experience, companies only offer review units like this when they know they have a solid product. It’s really only the NDA based reviews that get pressure to give positive reviews since companies will stop “inviting you” if you are not complimentary. My experience with light meters is somewhat limited, so I had to read the quick start manual, which is well laid out. However, if you want to understand how every aspect of this meter works, you need to read the 200+ page manual in full. I read the entire manual twice now and could read it a third time, but the Sekonic L-858D-U has some incredible features. If you are used to a more analog light meters, then using the touch display of the L-858D-U takes some adjustment. Sekonic did an excellent job of placing most of the features you would want on the main screen but, the multiple levels required for features that could be a simple toggle button should be simplified in a future UI update. The UI is intuitive once you get used to all of the abbreviations, but it would be great if Sekonic had UI modes for various levels of experience. One of the big advantages of a touch screen like the one used here is that they can make the menus highly customizable. For instance, if the light meter was in beginner mode, it could show an expanded scrolling menu at startup that let you pick aperture, shutter, ISO, Movie Mode, etc… Alongside the use of descriptive labels would make the light meter easier to learn. The descriptive label with icons next to them would prepare you for more advanced/condensed modes once you became familiar with the proper icons. 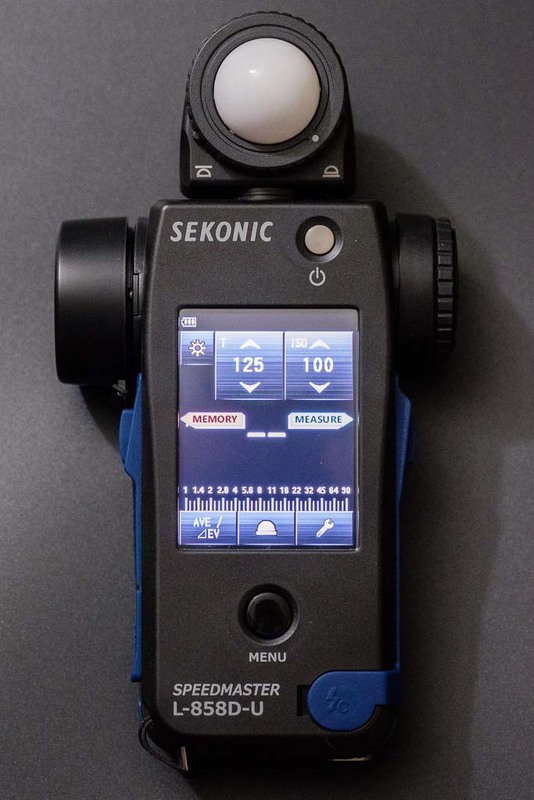 Beyond UI , the Sekonic L-858D-U is a very smart lightmeter. It auto dims the backlight to limit/stop the screen from influencing your measurements. You can also lock the touch screen by holding down menu, but then still take measurements and store them in memory if accidentally activating stuff on the touch screen is a concern for you. This would be even more useful if there were a dedicated button for switching between spot and incident metering. Maybe they could auto switch the memory button for this feature since there is no way to average your stored measurements with the screen locked. There might be a way to do this already, but if there is, it is not apparent from my reading of the instruction manual. The Sekonic L-858D-U allows you to perfectly balance the light of even the most complex scene, with the ability to save up to 9 measurements in memory to be averaged. It can even take into consideration filters, with the capacity to store up to 30 filters with +/-12 EV in 0.1EV step increments and then you can apply up to 4 saved filters to your saved measurements. This feature works well, but setting it up can be time-consuming. It would be great if filter companies released official presets to load via software. Speaking of loading stuff into the lightmeter, building a profile for your camera adds an additional level of usefulness to the L-858D-U and cost. 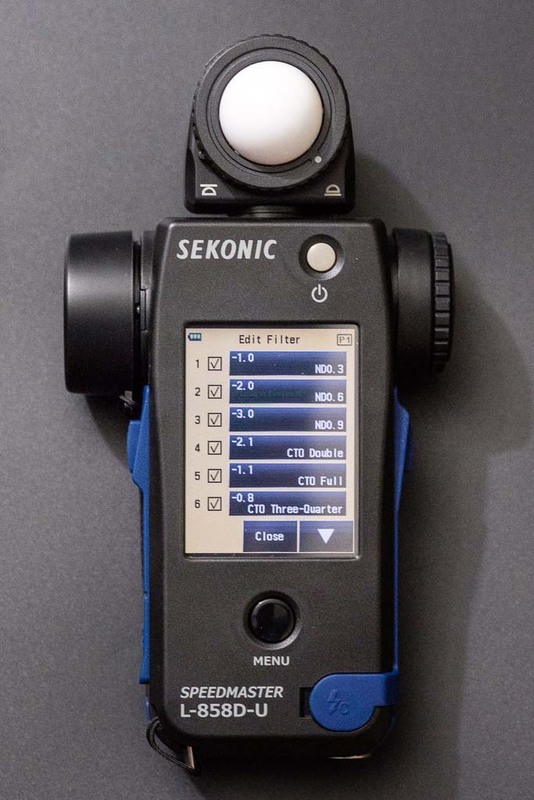 With the Sekonic’s ability to store up to 10 camera profiles it makes sense to profile all of your cameras, but to do so, you have to buy an Exposure Profile Target II, X-rite’s ColorChecker, or Datacolor SpyderCHECKR. Including one of them or even working out a bundle would have been nice at this price point since this is a feature every photographer should use. The screen on the Sekonic is very clear, but low resolution. It also comes with an antireflective screen protector that I didn’t find necessary in the Florida sun. The inclusion of such an accessory made me wonder why they didn’t just incorporate it into the display, to begin with, but maybe some people’s eyes are more sensitive to the extra layer since this is a resistive touchscreen instead of a capacitive one like most phones are today. The inclusion of a capacitive touchscreen would have been preferable, but I think they used a resistive touch screen because they are more durable. I wasn’t able to test the wireless flash triggers or the advanced flash tools of the L-858D-U because I rarely shoot flash photography, but the ability to measure T time is incredibly useful for studios. 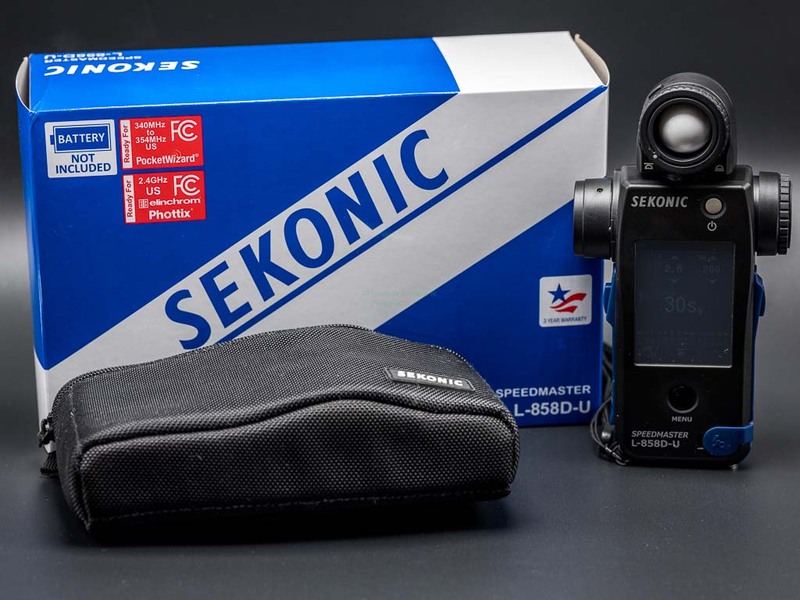 The Sekonic L-858D-U should be equally at home in the studio or outdoors shooting landscapes. The ability to trigger your flashes right from the Sekonic is incredibly useful, but not entirely necessary. The radio triggers are a luxury compared to profiling the light meter for your camera. Did I mention the Sekonic is also good for cinematographers? I am not overly familiar with cinematographer terminology, but I do know that shooting log can make nailing exposure difficult. I am also aware that some cameras have to be over or underexposed when shooting log to be graded properly and all of this can be incorporated into your Sekonic camera profile to save time. Most of the photographers that I know buy one light meter and use it until it breaks, and it may never break. Almost all of them buy Sekonic. The Sekonic L-858D-U is certainly a lot of light meter for any photographer, and it feels like it is built well enough to last a lifetime. Even though I have a few gripes with the unit at this price point, I think it is worth investing in a L-858D-U today, because it will save you time and camera actuation, which add up to money. Lightmeters are still incredibly useful today, and I am glad that I have incorporated one into my photography because it makes me more efficient.